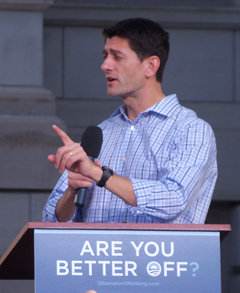 Republican vice presidential nominee Paul Ryan is due in Dubuque early this evening for an event as Loras College and he’ll make appearances Tuesday in Clinton, Muscatine and Burlington. Democrats started traveling the state this past weekend with a “Gotta Vote” bus tour and they stopped this morning in Dubuque. 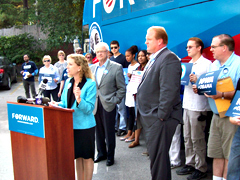 Democratic National Committee chairwoman Debbie Wasserman-Schultz, Congressman Boswell, former Governor Chet Culver. According to Wasserman-Schultz, Democrats have a “fully-functioning ground game” in Iowa for every day voting is allowed in Iowa. The Democrats’ “Gotta Vote” bus tour will make stops in Cedar Rapids this afternoon and in Iowa City early this evening.